TOKYO, August 29. /TASS/. 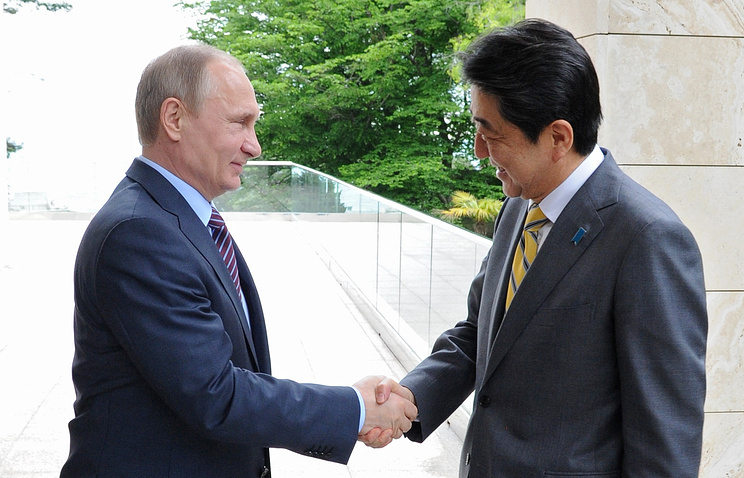 Japanese Prime Minister Shinzo Abe will meet with Russian President Vladimir Putin on the sidelines of the second Eastern Economic Forum that opens in the Far Eastern Russian city of Vladivostok this week, Chief Cabinet Secretary Yoshihide Suga said. "Talks at the top level will be held in Vladivostok at the economic forum," Suga said. "I think the meeting will discuss a wide range of issues of Japanese-Russian relations, including the possible visit to Japan by President Putin. Suga also noted the readiness of the Japanese side to hold "a positive dialogue aimed to the future" with Moscow on the peace treaty. The problem of the southern Kuril Islands is the key obstacle to complete normalization of the Russian-Japanese ties and the signing of a peace treaty. After the Second World War, all Kuril Islands were made part of the Soviet Union. But Japan does not agree that the islands of Iturup, Kunashir, Shikotan and the Habomai island group belong to Russia. Tokyo calls the islands "Northern Territories".